Liberia Elections - Who Will Succeed Ellen Johnson Sirleaf? At least 74 percent of results from the October 10 elections have been released by the National Elections Commission with the main contenders still far from attaining the constitutional 50 percent plus one vote required to be declared winner. Saturday’s results, according to the NEC Chairman, Cllr. Jerome Korkoya, were tallied from 3991 of 5390 Polling Places. The opposition Coalition for Democratic Change (CDC) led by former soccer star and Senator for Montserrado County, George Weah, is comfortably in the lead, having acquired 441,839 of the 1,193,331tabulated so far. This represents 39.2 percent of the votes. Liberia’s Vice President, Joseph Nyumah Boakai follows Senator Weah with 334,162 votes which is 29.6 percent. Vice President Boakai who seeks to replace his boss, President Ellen Johnson Sirleaf spoke with journalists at the headquarters of the Unity Party on Friday. “As far as I’m concern, I know the Unity Party is going to win the elections, nothing is going to stop it,” he told journalists. Speaking on his optimism of winning the elections, Vice President Boakai said he went into the election and win. Cllr. Charles Walker Brumskine of the Liberty Party has so far attained 109,345 representing 9.7 percent. Cllr. Brumskine on Friday called for a rerun of the October 10 presidential and legislative elections, alleging that it was marred by gross irregularities and fraud. “The October 10 elections did not pass the minimum standards required for free, fair and transparent elections. These elections were characterized by gross irregularities and fraud which undermined the integrity of the elections and deprived thousands of Liberians their constitutional rights to vote. Based on our assessment of the evidence available, the results of these elections are not valid,” he told journalists on Friday. The Former Coca-Cola executive, Mr. Alexander B. Cummings of the Alternative National Congress (ANC) is so far fourth place with 77,298 votes representing 6.9 percent. The standard bearer of the Movement for Democratic Reconstruction (MDR), Prince Y. Johnson, Senator of vote rich Nimba County has attained 74,470 votes which is 6.6 percent of votes counted so far. Liberian businessman and co-owner of GSM giant, LoneStarCell/MTN, Mr. Benoni Urey (ALP) has 17,796 accounting for 1.6 percent. Urey has formally complained to the NEC that results coming out of the elections for him are unrealistic. According to Urey, the ALP is popular in Bong, Margibi and Montserrado Counties, therefore, the party cannot trail in these counties. The Chairman of the NEC has acknowledged the complaint and said the complaint has been passed on its Hearing Committee. The Lone female candidate in the presidential race, Macdella Cooper of the Liberia Restoration Party (LRP) has obtained 8,915 votes which accounts for 0.8 percent of the results released so far. Former security advisor to President Ellen Johnson Sirleaf, Dr. Henry Boima Fahnbulleh, Jr. of the Liberia People Party (LPP) has 8,659 which is 0.8 percent. Senator of Margibi County, Oscar Cooper, who contested the presidential elections as an independent candidate has gotten 7,826 votes which is 0.7 percent. 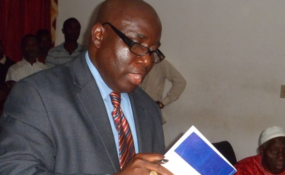 The former Governor of the Central Bank of Liberia, Dr. Joseph Mills Jones of the Movement for Economic Empowerment (MOVEE) is trailing with 9,339 accounting for 0.8 percent, according to the progressive report.